Nations agreed today (November 13) to hold another week-long diplomatic meeting on 11-15 April 2016 to continue their deliberations on questions relating to lethal autonomous weapons systems. These are weapons that would select and attack targets without further human intervention. The Campaign to Stop Killer Robots sees this decision as positive in that talks on killer robots will continue at the Convention on Conventional Weapons in Geneva, and that no country tried to block it. But, the decision lacks ambition, shows no sense of urgency, and reflects the CCW’s usual ‘go slow and aim low’ approach. The new mandate for work is essentially the same as for the last two years. The only new aspect in the mandate for 2016 is language stating that the April meeting “may agree by consensus on recommendations for further work for consideration by the 2016 Fifth Review Conference.” This is an improvement, as it implies the experts group is working toward a concrete outcome and that work will continue after the Review Conference. But the mandate falls far short of a truly desirable outcome. The Campaign to Stop Killer Robots has been calling on states to agree to a more formal and substantive process, with two to four weeks of work, to address the multiple technical, legal, ethical and other concerns that have been raised. Treading water is no solution as technology advances towards ever-increasing autonomy in weapons systems. In an unfortunate incident earlier today, campaign representatives were told to leave an informal consultation held by the chair to discuss plans for addressing autonomous weapons in 2016. This came after the United Kingdom objected to their presence. No state supported the UK’s request, but the chair asked NGOs to leave. Afterwards, Mexico affirmed in plenary and the UK ambassador privately informed campaign representatives that the incident does not set a precedent for future deliberations. Since 1995, the precedent at the Convention on Conventional Weapons has been to allow for non-governmental organizations to attend all sessions, including its informal meetings, which are off-the-record. 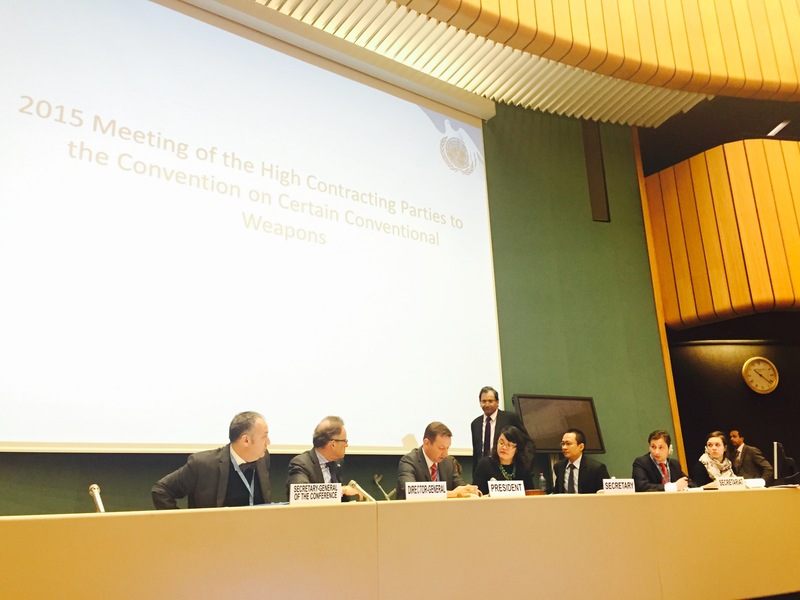 Ambassador Ms. Tehmina Janjua of Pakistan will serve as President of Fifth Review Conference of the Convention on Conventional Weapons in Geneva on 12-16 December 2016. Statement to CCW by the Campaign to Stop Killer Robots, 13 Nov. Statement to CCW side event briefing by Campaign coordinator Mary Wareham, 13 Nov.
Report by Reaching Critical Will, 17 Nov.